Haworth never looks more beautiful than when it’s under a coating of snow, with the white expanse of moorland stretching away beyond it in rises and falls – as shown in the picture at the head of this post, which is thanks to the wonderful Haworth shop Hathaways. As snow is general all over England today (to borrow a line from James Joyce) I thought we should look at the Brontë’s attitudes to snow in their lives and writing. The freezing temperatures that Haworth has in December must have been even more fierce for Anne Brontë and her sisters, without any form of automated heating and without the thick layers of clothing that we take for granted today. The best they could do would be to pull another shawl around their shoulders, and place metal pattens over their shoes to protect against the damp and ice. As anyone who has visited knows, Haworth Main Street is very steep, as are many of the streets running off it, so it can be especially treacherous in winter. It is for this reason that the road is cobbled, giving extra traction to human boots and horse hooves. 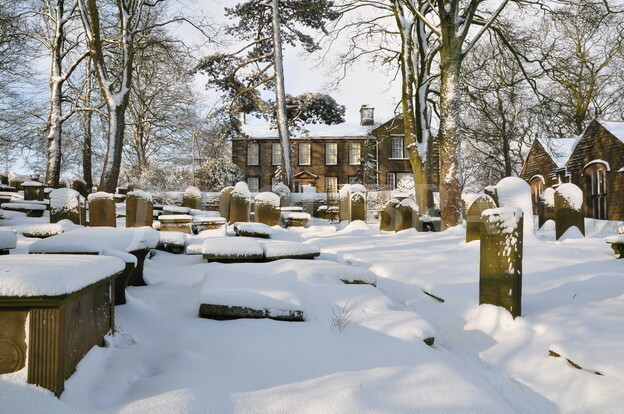 Tabby Ayckroyd, the loyal and much loved servant of the Brontës, found out how dangerous it could be in the winter of 1836 when she slipped on ice and sustained a broken leg. This caused pain and discomfort for Tabby for the rest of her life, and Patrick Brontë and Aunt Branwell suggested that it would be better for her to leave their employ to be looked after by her sister Susannah. The Brontë sisters, however, would hear none of this and threatened to go on hunger strike unless Tabby was allowed to stay – they won the day, but as Tabby was no longer able to carry out all her previous tasks it marked the start of Emily’s years as Haworth Parsonage’s very own domestic goddess. 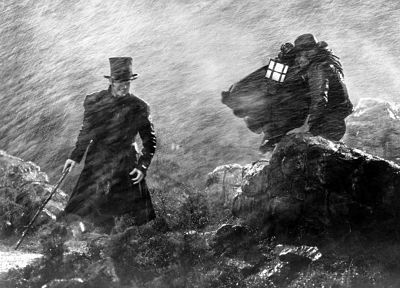 Snow features in all the sisters’ books, but it is almost a character itself in Emily Brontë’s Wuthering Heights – gone is the white purity normally associated with snow; it is instead dark, blinding, incredibly dangerous – snow is in effect nature’s Heathcliff. Much of Agnes Grey is based upon Anne’s own experiences as a governess, and we can surely see hear a reflection of a real life dilemma Anne experienced when in charge of the unruly Ingham children of Blake Hall in Mirfield. Snow is also used as a metaphor in Charlotte’s final finished novel Villette, as it is used in the surname of the heroine Lucy Snowe. We know that in original drafts she was called Lucy Frost, but both surnames sum up the cold hearted despair that Charlotte herself felt when rejected by Constantin Heger in Belgium, the real life catalyst for her brilliant novel. If you’re going out today wrap up warm – and don’t forget your winter bonnet and pattens!